DIY Lace-Like Stepping Stones | DIY projects for everyone! There is no reason why stepping stones have to be just functional. This project lets you create a unique piece for your garden! The idea behind these stepping stones was truly a Eureka moment. The owner found fifteen square stepping stones buried beneath the soil from their previous project. And while strolling through a secondhand store she saw some vinyl doilies, but just went past it. One morning while having a coffee she happened to notice the plain stepping stones, and then her gaze shifted to the doily, Eureka! This idea allowed them to give their backyard a makeover. Do the stepping stones in your yard look dull? This an easy and inexpensive way of decorating them! A pair of scissors or a serrated knife. You are not limited to square stepping stones. In fact, if you enjoy working with concrete, you could even make your own, in any shape you desire! Round stones, square, rectangles and so many other shapes are available in large home improvement centers. Try to choose a stone color that will be in contrast to the paint color you choose. Dark stone, light paint. Light stone, dark paint, and so forth. The best weather for this project would be a nice, sunny day, maybe even with a bit of a breeze. You’ll likely want to scrub or rinse off your stones to remove any concrete residue that may prevent the paint from adhering properly. Please note, you don’t have to purchase a specific scrubbing tool for this, you could use an old hairbrush, a dirty old rag, an old toothbrush or such. And no, not your significant other’s toothbrush, even in a moment of anger. Rinse the stones off well and allow to dry thoroughly. Don’t be impatient. Let them dry. We’re used to weeds around here, but if you are not, consider laying fabric on the path where you will place your stones. I actually enjoy the more natural look, and not one that is so refined. We do, after all, live in the country. Trim, yank, pull or do whatever is necessary to clear weeds from the area where your stones will be. Keep in mind, you don’t want to fight with things getting in the way when painting. As for the Vinca major shown, take my advice. Don’t plant it. We’ll talk about that later. Maybe. An easy way to do this is to place the stones as you wish, then run a weed trimmer over the tops and sides of the stones to clear away any plant growth. If you have a work table available, a small stack of newspapers should suffice to keep the paint off your table. If you are working directly on the ground, a painting shield may come in handy. Simply lay one of your stones on top of a large piece of cardboard or poster board, then trace around it with a pencil. Remove the stone and cut the traced shape out of the board. The cardboard should now fit snugly over the stone. This method allows you to spray only the stone, and not the surrounding materials and plants. It also helps to keep the spray from landing on stones you have already completed if you are working on a walkway that is already set in place. 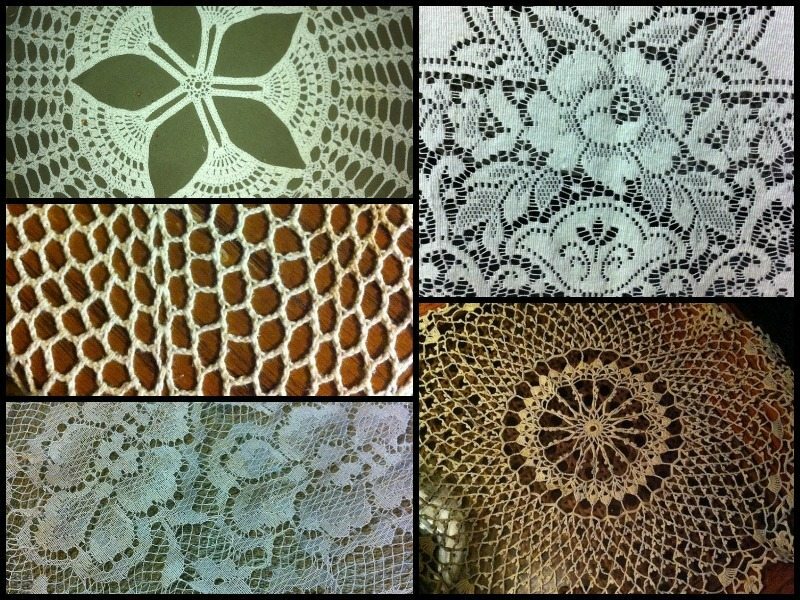 As a very devoted fan of the doily, I would like to mention that I don’t necessarily approve of the damage and / or destruction caused to crocheted doilies should you choose to go that route. However, if you simply must, try to sacrifice one that is stained heavily, torn, etc. and not a nice one. If hand made, quite a bit of work went into it. Personally, I do not know how to crochet (yet) and am envious of the talent. 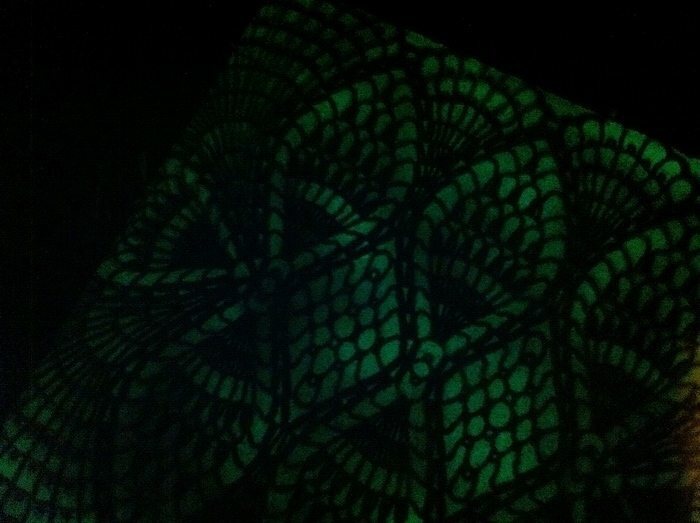 If you can’t find a vinyl doily, don’t fret. There are so many other options! Some of the larger box stores sell lacy plastic or vinyl tablecloths or table runners in rolls or by the yard. Plastic stencils work great, too, and can often be found in hobby stores in so many shapes, and even alphabet stencils are a thought, too! Consider using word stencils to spell out one of your favorite short quotes, placing one word on each stone. Or choose a quick and easy project and make three stones with “I Love You” or “Live, Love, Laugh”. You have already thought of ideas, haven’t you?